This is the first compilation released on Cryoworks. 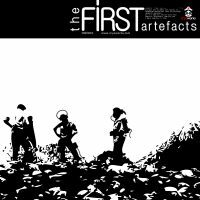 In fact, these tracks are the first we've found in this desolate world worth spieling about... and this is why we called it "The First Artifacts". Chris Herbert opens the compilation with a ghostly ambient tune. Followed up by Jamie Drouin, who presents his project, VRSN, and an untitled track which will conjure up images of drones whispering cybernetic spells into your ears. The next track will submerge you under the sea, where you will meet genetically modified marine life, the bi-products of a clandestine research project wrested from the hands of mad biologists and their nano-technology. The next tune comes from Sweden and deals with intercontinental interferences. Spooky. Strangelet's track closes the ambient part of the compilation brilliantly with a track that conjures up images of bio-oddities roaming in search of company. The second half of the compilation delves into minimalist aesthetic; a discreet dialogue created through the least number of sounds available; a conversation created by Strcprstskrzkrk that offers up the foundations for the proceeding masterpiece by Platform. Platform revels in rich textures and clear sound that will take you far, far away. Followed by Donkeyworks, who tells you a short story about one little ice floe... drifting...slowly. The compilation concludes with _clean's track – Trats, which paves the way for future Cryowork explorations into scifi sonic territory.